Saturated fatty acids suppress adrenocorticotropic hormone (ACTH) release from rat anterior pituitary cells in vitro. In this article, we present a newborn baby boy with adrenocorticotropic hormone (ACTH) resistance syndrome who underwent branding because he became abstracted and had poor feeding. 1] In 80-85% of cases CS is adrenocorticotropic hormone (ACTH) dependent, the result of a pituitary corticotrophic adenoma or an extra-pituitary corticotrophic adenoma (i. Plasma renin activity and plasma concentrations of aldosterone, cortisol, adrenocorticotropic hormone and alpha melanocyte-stimulating hormone in healthy cats. This is suggested by the reductions of corticosterone and adrenocorticotropic hormone, as well as changes in intestinal permeability (ability to hold intestinal contents in place and not have them leak into the bloodstream). There were no signs of hyperpigmentation or alacrimia to suggest triple AAA syndrome (achalasia, alacrimia, adrenocorticotropic hormone (ACTH) deficiency). The therapy mainstay is adrenocorticotropic hormone (ACTH), injected daily for 6-8 weeks. The tumor was secreting adrenocorticotropic hormone, he said, which caused the pain. During normal pregnancy there is increased production of corticosteroid binding globulins by the liver and increased placental production of cortisol releasing hormone (CRH) and adrenocorticotropic hormone (ACTH); this causes elevated levels of total and free cortisol which may result in increased salivary and urinary free cortisol levels (Table-1). 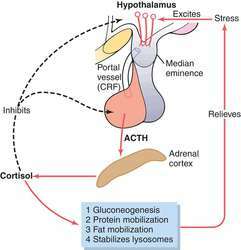 When a stress is identified, the hypothalamus releases corticotrophin-releasing hormone (CRH) via a portal system to the nearby pituitary gland, where it stimulates the release of adrenocorticotropic hormone (ACTH) that subsequently travels via the bloodstream to the adrenal cortex and prompts additional output of the hormones cortisol and DHEA. 4]), thyroid-stimulating hormone (TSH), cortisol, adrenocorticotropic hormone (ACTH), triiodothyronine (T3) testosterone, luteinizing hormone (LH), follicle-stimulating hormone (FSH), estradiol and progesterone were measured, radio-immune assay (RIA) being used to measure pituitary hormones by means of commercially available kits (Immunotech a.